Sarah Palin had the privilege of meeting thousands of everyday Americans when she ran for the 2008 Presidential. Inspired by these encounters, America by Heart celebrates the enduring strengths and virtues that have made this country great. 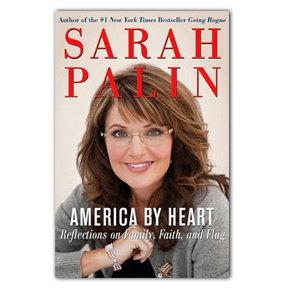 Written in her own refreshingly candid voice, America by Heart includes selections from classic and contemporary readings that have moved her — from the nation's founding documents to great speeches, sermons, letters, literature and poetry, biography, and even some of her favorite songs and movies. Here, too, are portraits of some of the extraordinary men and women she admires and who embody her deep love of country, her strong rootedness in faith, and her profound love and appreciation of family. Sarah Palin is one of the most influential political figures of our time. Her book is a must-read for those who want to gain insight into the thinking of the Hockey Mom from Alaska who has helped lead the tea party movement in shaking up American politics and Washington as we know it.